Here you can put the pulled sugar decoration on a freshly baked apple tart, then served it with vanilla ice cream. The crunchy sugar along with the warm apple and cold ice cream is a heavenly 5-star dessert that will definitely blow your guests away. The plus side: it’s extremely simple to put together. 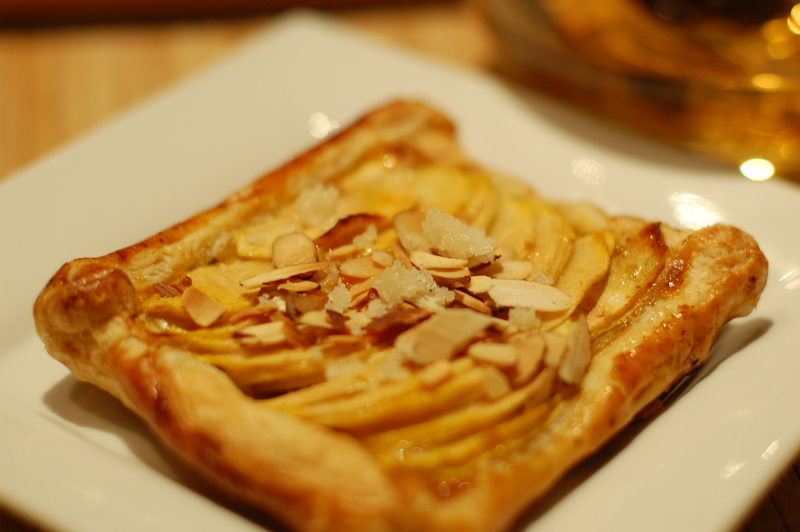 This is inspired by Chef Becky’s apple tarte tatin. 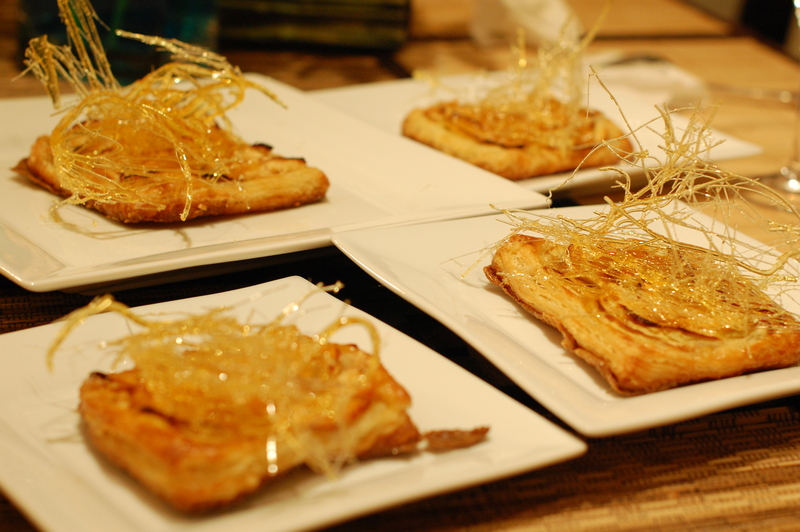 Her dessert involves putting a caramelized sugar syrup first, then layer with apple slices, then top with a puff pastry. After baking you have to flip upside down. I want to make it simpler, and don’t want to use too much sugar. Thus I’m using apricot jam for glaze and don’t need any flipping. Preheat the oven to 375 degrees. Cut the puff pastry into 4×4″ squares (or any size you like). Poke a few holes on the puff pastry using a fork. Nicely arrange the apple slices on top, and fold the sides of the pastry in to create a 2-3 mm side border. Sprinkle with dash of cinnamon powder (you may add tiny bit of allspice and nutmeg if desired) and almond flakes. Brush the pastry side with egg wash. Bake for 20 minutes or until it’s golden brown. Brush with a layer of apricot jam. Top with the sugar decoration (as in the post of “Spinning sugar decoration”) and serve immediately with vanilla ice cream.